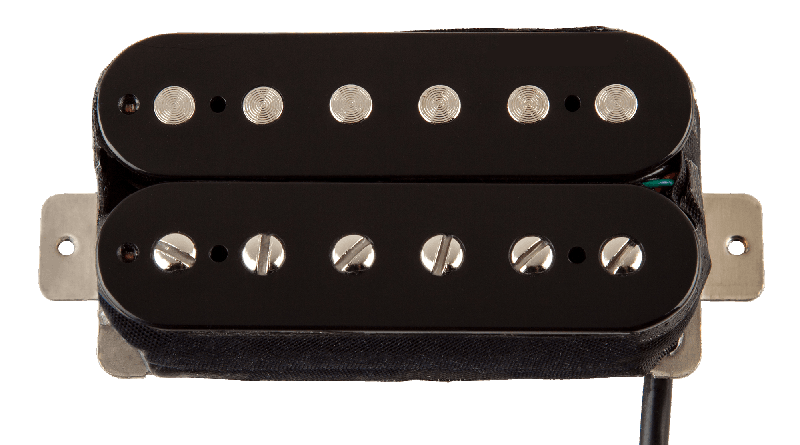 The Nostalgia neck humbucker is one I’ve been using since 2012. 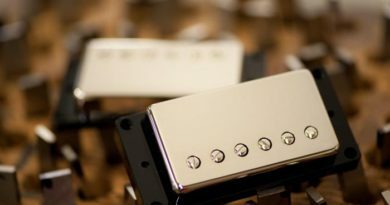 It’s been in play with each of the Dean DMT bridge pickups I’ve checked out and a it’s a great match for that purpose. There is also the Nostalgia bridge humbucker. And much like the original PAFs, they are both very similar in specs to each other. So much so that Dean’s pickup ace, Pat Baker, will say that a Nostalgia can be used in any position. And I have done that. But never as a set, until recently. 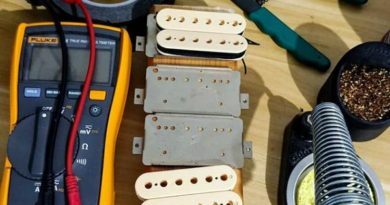 As is the case with the neck model, the Nostalgia bridge is patterned to be a vintage-style moderate-output humbucker in line with the classic selections of when humbucking pickups were new. And then in the 1970s, aftermarket pickups became a thing. Small builders, that are now industry institutions, made pickups that compensated for the trends of the time. Players were using thinner strings and playing amps that needed to be pushed. More aggressive pickups were sought to get it done. A degree of tone was sacrificed. And here we are, with a generation (or two) of players that haven’t known the difference. More recently, players have amps that don’t need to be hit with that much to get the desired effect. 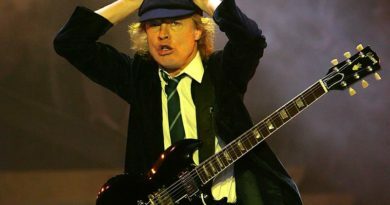 And guitarist continue to be more interested the voice of a pickup. If more “oomph” is needed, a player will use a boost pedal (for example) if it means keeping tone. More people are realizing that something that says “59” doesn’t mean it’s an accurate representation. And yes, I’m looking at both coasts when I say that. LOL! Dean has a slightly different approach to their pickups, and I think it’s cool. They can look at what’s out there and determine what’s working and what’s not. And Dean is positioned to be agile enough to offer options. So the DMT pickups are as if Pat Baker picked up the country by Florida and shook lesser pickups loose to rattle into other states, leaving the ones that make the cut. The Nostalgia set is installed in the same 2-hum super strat as the recent run of Dean pickup evaluations. Each pickup is connected to it’s own switch for series/split/parallel operations. The harness is laid out with Bourns pots and Switchcraft switches and output jack. I’m already on record as being a fan of the Nostalgia in the neck. In the bridge, the Nostalgia is full and rich. The voice is evenly-tuned, so as not to be too much or too little of any characteristic. I’m digging how it has some push, but is not too powerful. This is one of those areas where you are better off with a little more tone. You can always dial in a little more hair if you think you need to. Clean amp tones do very well with the Nostalgia set. It is very responsive to picking technique. Throw in some switching options and these pickups can take you from lush presence to glassy chime. Everything I’ve tried so far from Dean’s DMT line has been a solid offering. The Nostalgia humbucker set keeps that going. It’s going to be great for classic rock, hard rock, blues, heavy blues, even some jazz. If you know your guitar and your amp, you should have no trouble getting in to heavy genres with this set. The rip-roaring options of the Baker Act, Mountain Of Tone, and Time Capsule might be a touch much for some of you guys. That’s where the Nostalgia comes in to save the day. For reference, this Dean DMT Nostalgia humbucker set evaluation was conducted with a Fractal Axe-Fx II XL+ featuring Celestion Impluse Responses and Fractal MFC-101 MIDI Foot Controller. Real cabs used were Marshall 1960B cabs loaded with Celestion G12-65s, Vintage 30s and G12M Greenbacks.